Del's Pizzeria is located at 1101 Price St., suite 100. Del's is open Monday through Thursday from 4to9p.m., Friday from 4to10 p.m., Saturday from noon to 10 p.m., and Sunday from noon to 9 p.m. For more information, go to delspizza.com or visit the business on Facebook and Instagram. 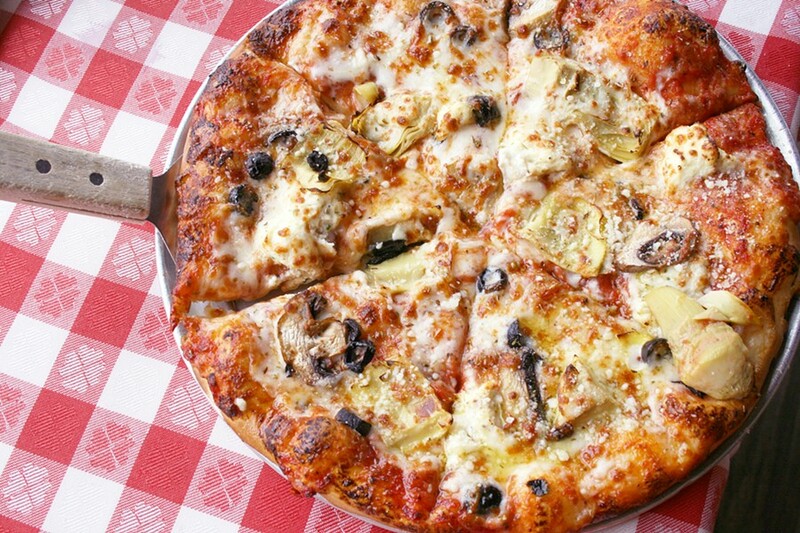 Good pizza is like a hug you can feel from the inside. It's like winning the softball game and finding $20 in your jacket on the same day. It's the stuff of quick, casual celebrations; the shared, passed-around feast of drive-in movies, sleepovers, and garage bands everywhere. PIZZA LOVES COMPANY Del's classic, comforting pizza topped with mounds of mozzarella is best when shared (although we get it if you prefer your own personal-sized pie). 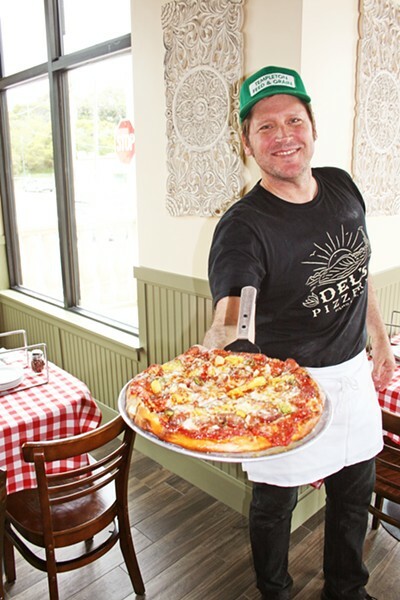 If you ask Ryan Delmore of Del's Pizzeria, what his family serves isn't so much delightfully chewy dough, savory sauce, mounds of bubbly mozzarella, and killer toppings—but heaping slices of pure "mama's love." Of course, he's talking about none other than his own mama, Bernadette "Mama Del" Delmore. You'll find the 71-year-old matriarch here most days, chatting with friends and customers she's known for years—and in some cases, decades. Del's has been around since 1973, so not only have they gathered fans, they've also attracted their fair share of celebrities (Jennifer Garner, Steve Martin, and Johnny Depp have all noshed at Del's; bodybuilder/actor Lou Ferrigno is a regular, and—as you might have guessed—he's always down for seconds of pasta). When Mama Del isn't serving beers or greeting longtime locals, she's in the new kitchen of her recently relocated restaurant, which moved to 1101 Price St. in Pismo Beach this month after more than 20 years at its former (pleasantly quirky) Shell Beach Road location. "Our new restaurant might be just 2 miles away, but it's a really big deal," Ryan says. "We're getting so much foot traffic here on Price Street; we're just slammed most nights." Of course, the Del's traditions are all still alive, even if the restaurant is oh-so modern (the new space features high ceilings, a bright dining room, and two dining patios). The pizza and pasta dishes are still made in what Ryan simply calls "classic, comfort food" style, with chewy-yet-crunchy dough (thanks to extra gluten) and bubbly cheese that oozes in sumptuous strings. You can still get that old-fashioned style lasagna, calzones, and meatballs. And yes, you can order your pizza crust gluten free, although I highly recommend the original. Ryan decides to let me go crazy in the kitchen, so I feel a little like family and less like a reporter. He presses out some dough and hands me an apron. I happily slap down some sauce, sprinkle on some mozzarella cheese, and add artichokes, mushrooms, olives, and dollops of ricotta cheese. He throws the round onto the conveyor belt, which passes through an oven set at more than 500 degrees. As I see (and smell) my creation come to toasty, melty perfection, Ryan gives me the rundown. The restaurant all started with "Big Ed," Ryan's grandpa (although he never let him or his brother, Darren, ever call him the dirty "g" word). "He was a Vegas guy, and placed a bet on the 1973 Super Bowl. Well, the Dolphins won," Ryan says with a laugh. "So our grandpa got a bunch of money and gave it to my dad and said, 'Open a pizza place.'" If this sounds crazy, well, it kind of is. But it's totally crazy in one of those "how America used to be" ways. Ryan and Darren's dad, Jim Delmore, had lived in Southern California, where he'd grown up working in pizza shops since he was 12. At the time of the big win, he had been managing Spyglass Inn restaurant in Shell Beach. He had all the knowledge to start his own pizzeria—and now, with this newfound money, he could finally open his own spot. SINCE 1973 Ryan Delmore of Del's Pizzeria and his brother Darren grew up in the pizza business and have yet to change their popular family recipes. Now, 45 years after first opening, the family invites folks to check out a brand new location at 1101 Price St., suite 100. Del's Pizzeria opened in March of 1973 at 1759 Shell St. in Pismo Beach, where Mei's Chinese Restaurant stands today. A photo of Bernadette, or as her friends call her, "Bernie," hangs above the new dining room as homage to this special time. Donning bell-bottoms and a polyester shirt, she stirs a pot of sauce at that first location. It's strange to think, but Ryan was growing inside her at that moment. She looks extremely happy and excited about the future. "My brother and I grew up on pizza. It was kind of like the T.V. Show Bob's Burgers but with pizza. And now my kids are growing up with it, too," Ryan said. Ryan's son, David, maintains the business website, and his daughter, Kate, works the floor. The youngest son, Sam, hosts and buses. A wine industry pro, Darren handles the beer and wine aspect of the business (he can be credited for installing the state-of-the-art wine keg, which keeps every glass super fresh). In 1994, Del's moved to a second, larger location, at 401 Shell Beach Road. You might know it intimately—plenty do. Built in the 1920s, locals will likely remember the old-time feel and live bands. Although the second space was roomier (the first location only had 10 tables), the kitchen was ridiculously small. Still, the family made do, churning out those famous pizzas and calzones night after night. This is where Ryan and Darren literally grew up over the past two-plus decades. It was a place of life lessons and friends and a million birthday parties. Through it all, Mama Del was always on hand, whether to help serve, stir the pot, or even fish an old man's dentures out of his own bowl of spaghetti (true story). Although the Delmores have fond memories of the old place, this new, 3.0 location offers a clean slate, a better setup for customers, and—finally—a kitchen that can fit the whole family side by side. After a final night at the old Del's featuring local musicians The Ragged Jubilee and Shawn Clark, the family closed its doors and looked toward a new horizon. "There were about 300 people there, and we were using all our dough and cheese, doing pizzas by the slice," Ryan said. "Of course, it was very bittersweet." And Mama Del? Sure, she shed a few tears. But now she is optimistic as ever, just like that iconic image that hangs so proudly in the new dining room. Hayley Thomas Cain loves Del's gluten-heavy crust topped with spicy, local Cattaneo Brother's linguisa. She can be reached at hthomas@newtimesslo.com.